Hebe is the goddess of youth. Her job in Classic mythology was to pour the drink of immortality to the other Greek gods. The drops she has been put in charge of managing and distributing are thus very precious, and she is clearly deeply focused on the task. She is so calm – the folds of her dress almost folded like the fluting of an antique column. According to the myth, however, things still went wrong at one point as she spilled the drink and was fired. 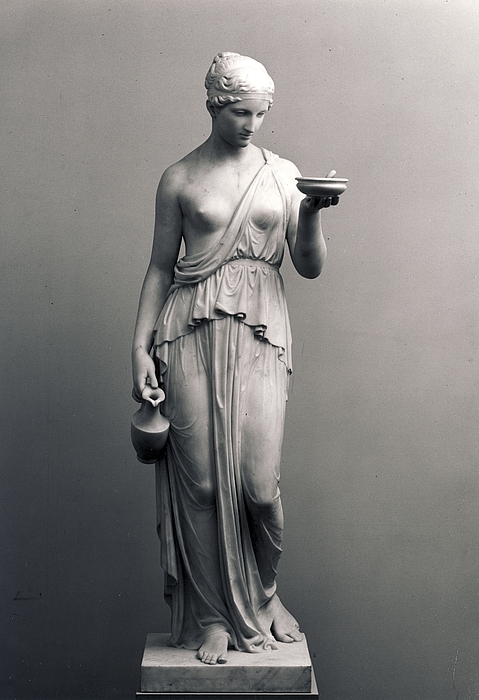 Thorvaldsen created two versions of Hebe, this statue from 1806 and a second statue in 1816, nearly identical to the first but with the chest fully covered by the goddesses’ dress.